How to find a Vulnerable Website and Start Hacking? Now a days Website Hacking has become a tradition or fun to create problems for other people. Hackers are searching for finding the holes in the websites having high page ranks and traffic. Who knows what the hackers are going to do or their next target is on your site? Few years back there is not so much terror of being website hacked because at that time there is not so much of powerful tools developed by humans, but now the time is that even a newbie can find a vulnerable website and start hacking. Website security is possibly today's most overlooked aspect of securing the enterprise and should be a priority in any organization. Hackers are concentrating their efforts on web-based applications - shopping carts, forms, login pages, dynamic content, etc. Web applications are accessible 24 hours a day, 7 days a week and control valuable data since they often have direct access to backend data such as customer databases. Any defense at network security level will provide no protection against web application attacks since they are launched on port 80 - which has to remain open. In addition, web applications are often tailor-made therefore tested less than off-the-shelf software and are more likely to have undiscovered vulnerabilities. 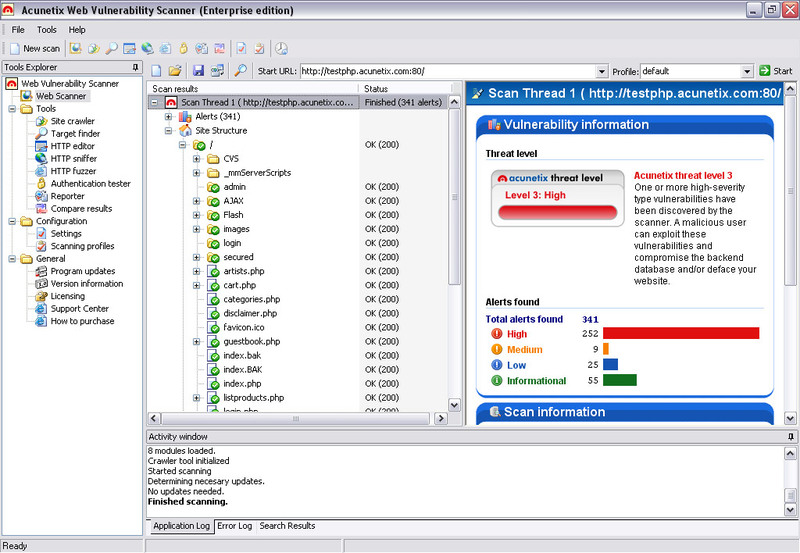 Acunetix WVS automatically checks your web applications for SQL Injection, XSS & other web vulnerabilities. 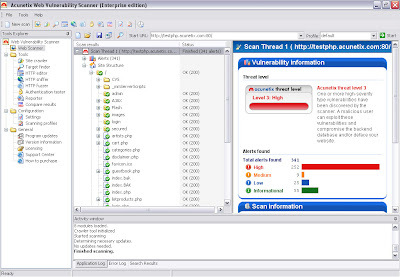 Acunetix is the world’s best tool developed to find a venerability in any web application as It automatically checks your web applications for SQL Injection, XSS & other web vulnerabilities. hey karan from which site you get this text banner image which is on top. I dont get your answer,please explain me in more details. karan open this image http://2.bp.blogspot.com/-8YCb-ymj7Qg/Tc4VVfkkGgI/AAAAAAAAAts/KukB6uaIpls/s1600/Logo%2BTemplate%2B-%2Ba_Logo_12.jpg how did you make this? i found it very cool image for blog please tell me how you have made it can you made one for me? i'll be very thankful to you. I will make this image form adobe Photoshop. but from where you've got the background please give me the link.you know karan a blogger blog because he want's to share the things that he know so please help me. These banners,logos,posters and images are copyright protected under me,you cannot use them for different purposes. Moreover, any other help is welcomed. ok, then karan tell me how you've make Your Help Is Precious? My site is all about ethical hacking and security tips not about blogging resources,widgets,css,htmls,if you want to know problems regarding your template and widgets then please visit www.mybloggertricks.com, www.allblogtools.com etc. Any help regarding ethical hacking and so on is purely welcomed. The extensively held belief is that the kings and also queens Dog Harness Reviews of classical times were the very here first to style and use dog collars. How to Hack Website Using Havij- An SQL Attack? How to Hack PTC Websites using Multiclicker?